← The first cut of 2012! Well what an amazing day. I have been in the garden all day with a t-shirt and sunnies on and actually felt the need to put sun cream on my face! At midday it was 17 degrees outside the greenhouse and 25 degrees inside – and it’s only 22 March. It was just me, woody woodpecker, two ladybirds and the pheasant who has set up home in the field next door while he looks for a girlfriend! Heaven. 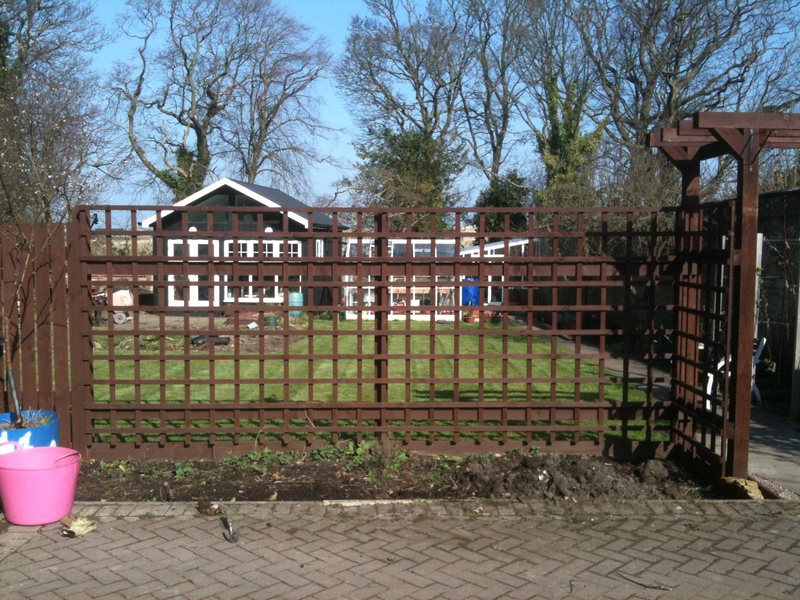 The trellis and flower bed where I plan to grow a wall of blue flowers. I have weeded the flower bed in front of the trellis, potted on the cosmos, osteospermums (all 2 of them! ), the gazanias and the dahlia pom poms. I also planted some ladybird poppy seeds in pots. It is something I did last year and it was really effective. The best part of the day was seeing the first of the tulips open. Until this year, all we had in the garden in the spring were snowdrops then daffodils. This year we introduced some crocus. A bag of 20 bulbs was purchased and planted but the 2 small circles of purple crocus was merely a drop in the ocean and hardly made an impact at all. I think we probably need 2,000 bulbs! We also bought loads of tulip bulbs but never got round to planting them in the ground in time. So we decided to plant them all in pots and once they have flowered and died back, we’ll stick them in the ground for next spring. An issue we have had in the past is our pots always crack and break with the frost. We did not want to risk it this winter, especially as most of them had tulip bulbs inside them. Mr Mac came up with a cunning plan! The reason the pots crack is because the soil gets waterlogged and then expands when it freezes and this cracks the pot. His theory was that if he could create a layer between the pot and the soil inside it that would allow expansion then the pots would not crack. Can you guess what Mr Mac’s solution was? BUBBLE WRAP! 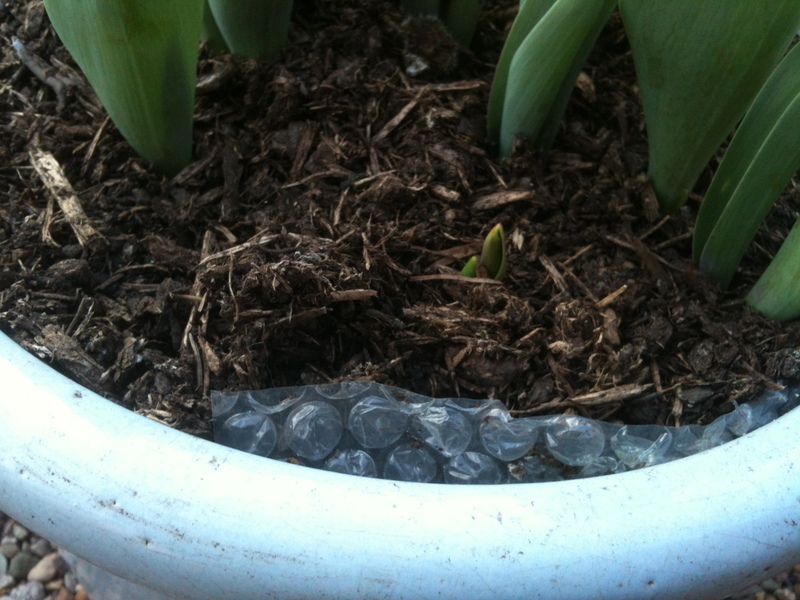 Yes, we lined each pot with a layer of bubble wrap then filled it up with soil and planted the bulbs. 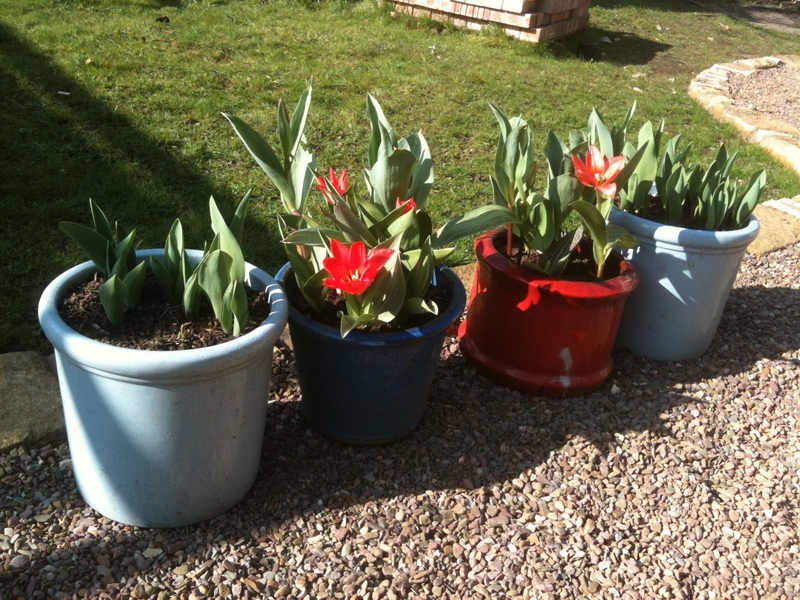 This did the trick and all the tulip pots survived the winter intact. The only pot that did crack is the one that I keep my blueberry bush in. It sits in a large saucer which retains water. Yes, you guessed it – the saucer filled with water, the water froze and cracked the pot! Typical. Anyway, the bubble wrap design is patent pending and you can look forward to seeing Mr Mac on the next series of Dragon’s Den! This entry was posted in Hints and tips and tagged nature, plants, poppy seeds, purple crocus, tulip bulbs, woody woodpecker. Bookmark the permalink.